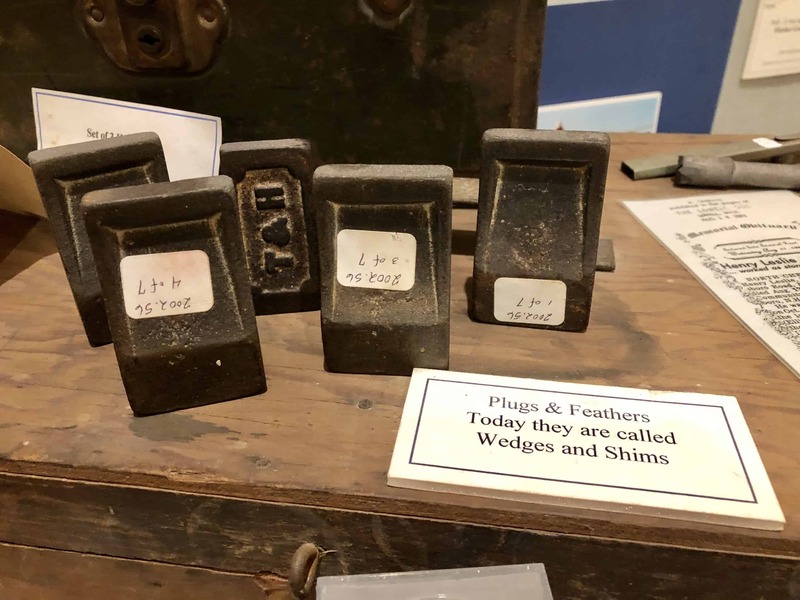 These wedges and shims (also known as plugs & feathers or wind blocks) were used in granite quarrying. 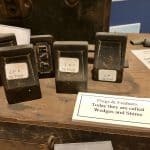 Archaeologically, the marks left by plugs and feathers can aid in dating structures when other records are not available. Both Native Americans and European colonists harvested stone with their respective methods. Westford history with granite quarrying goes back to at least as far as the nineteenth century, with sites of Snake Meadow Hill and Oak Hill. Near the latter, the Fletcher Granite Co. was established in 1881, founded by Herbert E. "Hobbie" Fletcher, off Rt. 40 at the border to Chelmsford. The granite from Westford is advertised as "Chelmsford Gray," and may be found across the country in places like Washington, DC. The company filed for bankruptcy in 2010, but have since resumed normal operations. 1/8 thick tapering to 5/32"
1 1/2" across and 2 1/2"